Date & Time: August 9-11, 2019 (Fri-Sun) from 9am - 4pm each day. Lian teaches basic techniques such as compositions and coloring, and his unique methods including "Color Pouring and Blending" and "Paint Around (negative painting)". There are 4-6 short demos each day with student practices between. In critiques Lian helps students by touching up their paintings. At end of workshop students may be able to finish their paintings, or learn enough techniques to complete them later. 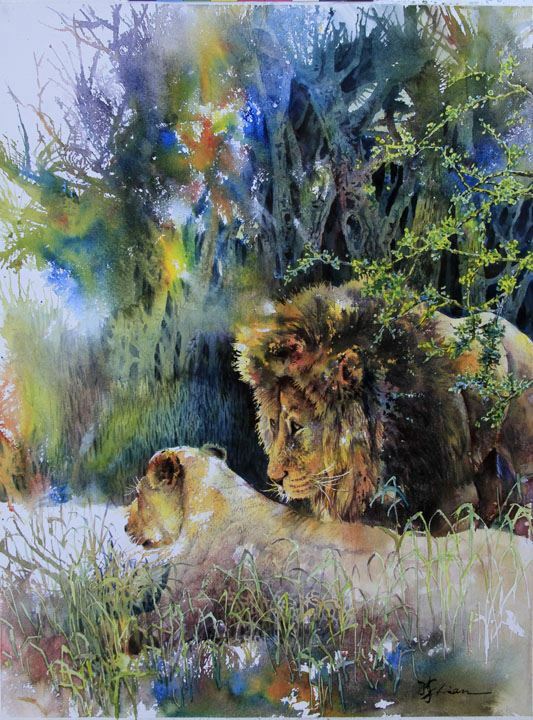 The instructor will be demonstrating how to paint animals and wildlife such as elephants, lions, birds, fish and underwater creatures as the subject matter for this Watercolor Painting class. His art teaching credentials include at the University of California at Berkeley where he taught watercolor outdoor sketching for 8 years; watercolor and Chinese painting workshops nationwide in US, and other countries in Europe, Canada, Mexico, Bahamas, China, South Africa and Australia. Also, Lian has been an invited juror for California, Colorado, New Mexico, Georgia, Arizona and Kentucky Watercolor Societies' exhibitions and other local shows.